← Artist Demonstration Day – Sat. May 24 – 12 to 3 p.m.
Did you miss Demo Day? 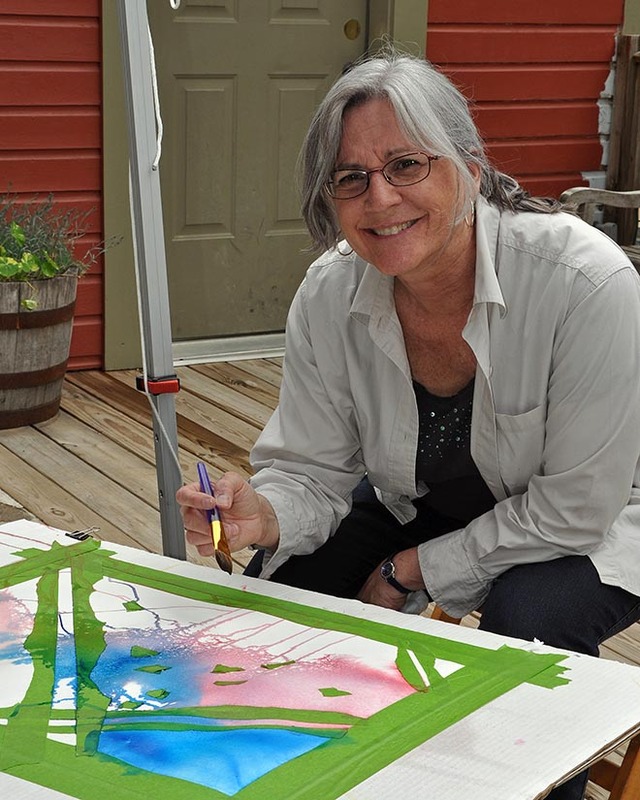 Sharon Loehr-Lapan demonstrates illustrating and painting on May 24. On May 24, Sawmill River Arts Gallery members had a fun day in the spring sunshine demonstrating their fine art and craft. As people strolled through the Bookmill complex, they talked with Joan Levy as she carved gourds and Sharon Loehr-Lapan as she painted illustrations and watercolors. Lana Fiala demonstrated how she makes her own recipe for herbal balms and offered a sample to anyone passing by. Over on the stone patio overlooking the mill’s rapidly rushing waterfall, Roy Mansur helped visitors to get a view of what he sees when photographing still life flowers through mottled glass. Roy Mansur shows how he sets up photographs of still life flowers through mottled glass on May 24 at the gallery. Kathy Litchfield also showed visitors how she twists handwoven scarf fringes to get a neat, knotted finish. A fun day was had by all and next spring, members will again gather to share their processes with art and craft lovers alike! Don’t worry, if you missed it, we’ll do it again next May! 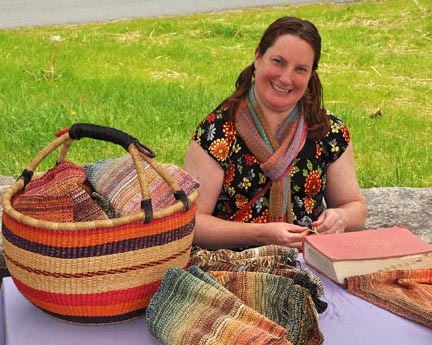 Weaver Kathy Litchfield demonstrates twisting fringe ends on a handwoven chenille scarf during Demo Day May 24. New art includes stained glass window hangings, new bracelets and jewelry selections, paintings and lightweight scarves. Visit the gallery Sunday May 5 for our annual Spring Fling Anniversary Thing AND . . . ArtWeek 2019! We’ll have artist demonstrations, refreshments and more to share! This special exhibit will feature Louise’s paintings of steam trains across the country! Opening Reception Saturday May 11, 1-4 pm. The gallery is located at 440 Greenfield Rd., Montague, MA, at the Montague Mill, next to a beautiful waterfall, lovely bookstore, restaurants, etc. Rain or shine there’s lots to see and do in this little corner of Montague, where we regularly connect with friends from all over the world. We would love to visit with you soon!